a method of exciting and amplifying electromagnetic oscillations. In this method, power amplification results from the expenditure of energy on the periodic variation of the magnitude of a reactance parameter (the inductance L or the capacitance C) in an oscillatory system. The possibility of parametric excitation and amplification of electromagnetic oscillations was first pointed out by L. I. Mandel’shtam and N. D. Papaleksi. Practical application of the parametric method, however, did not begin until the 1950’s, when parametric semiconductor diodes with a controllable capacitance were produced and low-noise parametric amplifiers were developed for microwave frequencies. quarter of a signal period, that is, Ts/4. For larger values of n, C changes at time intervals equal to nTs/2. A simple single-circuit parametric amplifier usually consists of an oscillatory system in which a harmonic voltage from a pump oscillator acts on a parametric semiconductor diode so as to vary the capacitance C; the diode’s capacitance is a function of the voltage applied to it. 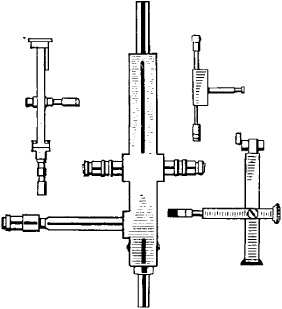 A parametric amplifier for microwave frequencies is made in the form of a four-way waveguide junction (Figure 3); the signal being amplified propagates along one of the waveguides and the pump signal along the other. where m = (Cmax - Cmin)/(Cmax + Cmin) is known as the depth of the capacitance variation. As (m/2)Q → 1, the amplification factor increases without limit; when (m/2)Q ≥ 1, the system turns into a parametric oscillator. A basic disadvantage of the single-circuit parametric amplifier is that Kamp depends on the relationship between the phases of the amplified signal and the pump signal. When (m/2)√QSQ2 → 1, the amplifier turns into an oscillator. Such an amplifier is called regenerative. If the amplified signal is removed from the second circuit of a regenerative amplifier, the amplifier is also a frequency converter. When w2 = wp + ws, all the pump energy and the energy stored in the signal circuit become the energy of oscillations at the sum frequency (wp + ws. Such a parametric amplifier is called a nonregenerative amplifier-converter. It is stable for any m and has a broad pass-band but only a small Kamp. In addition to the periodic variation of capacitance by means of parametric diodes, other types of parametric action are used. An inductance L can be varied periodically by using changes in the equivalent inductance of ferrites and superconductors. A periodic variation of the capacitance C can be obtained by making use of the dependence of the dielectric constant of dielectrics on the electric field, by using metal-oxide-semiconductor structures (surface varactors), or by other methods. The nonlinear properties of a density-modulated electron beam are made use of in electron beam-type parametric amplifiers. 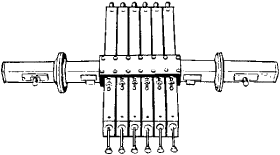 In addition to resonator-type parametric amplifiers, there are traveling-wave parametric amplifiers, in which the electromagnetic signal wave propagates along a wave guide and interacts sequentially with each of the parametric diodes (or other nonlinear elements) positioned in the channel. 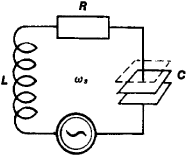 The capacitance of the diodes is varied by means of pump energy supplied to the resonators. 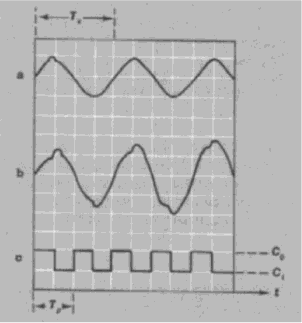 With the proper choice of frequencies, wavelengths, and directions of propagation for the pump and signal waves, the signal amplification increases exponentially as it propagates along the chain of diodes (Figure 5). A passband of up to 25 percent of the carrier frequency can be achieved in traveling-wave amplifiers—in contrast to a few percent for resonator-type amplifiers. Mandel’shtam, L. I. Poln. sobr. trudov, vol. 2. Moscow-Leningrad, 1947. Etkin, V. S. and E. M. Gershenzon. Parametricheskie sistemy SVCh na poluprovodnikovykh diodakh. Moscow, 1964. Regenerativnye poluprovodnikovye parametricheskie usiliteli (nekotorye voprosy teorii i rascheta). Moscow, 1965. Kaplan, A. E., Iu. A. Kravtsov, and V. A. Rylov. Parametricheskie generatory i deliteli chastoty. Moscow, 1966.